Your report on the forces driving the gentrification of Oakland portrays virtually any change in the city since some idealized point in its history as a detriment to people of color (as opposed to when Oakland was 95 percent white as recently as the 1940 U.S. census). 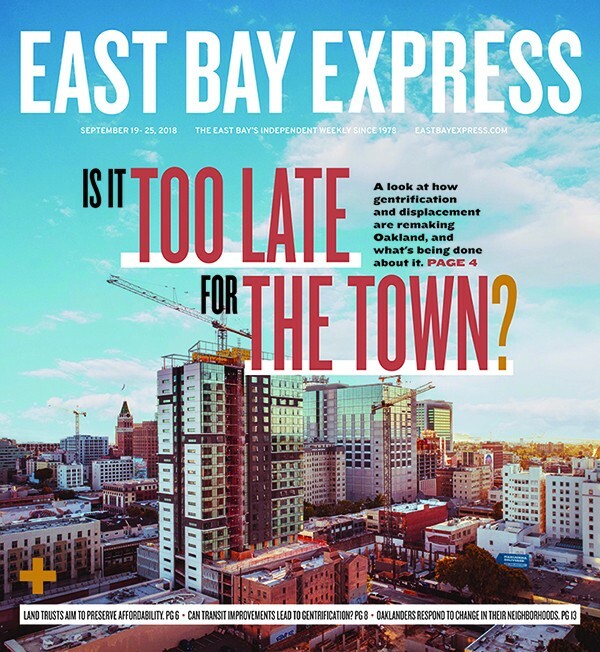 Perhaps the article should have instead been entitled "Make Oakland Black Again" — from all the hue and cry over an office and housing construction boom that is bringing in a bunch of outsiders who are "trying to act cool." Why can't we all celebrate the rebirth of a great American city that can be welcoming to all people instead of trying to derail growth as implied by the writer of the article? Millennial hipsters are an easy target. They're rich, mostly white, and prone to an unapologetic sense of entitlement. And then there are the beards. Shoot, even old honky hippies like myself find some of them unbearable. But the Blindspotting narrative of people of color being run out of our town by wealthy techies does not jibe with census data on the changing composition of Oakland's population. In 1980, the Black population of Oakland peaked at 47 percent. Whites were 38.6, Asians 8.3, and Latinos at 9.5. (It totals more than 100 percent because of the biracial overlap.) Fast forward to 2010, and Blacks are at 28 percent; whites, 34.5; Asians, 16.8; and Latinos, 25.4. In short, in a 30-year span, our Black populace has dropped precipitously, which is obvious to anyone who has lived here, but the white numbers also declined modestly. The majority of population growth has been in the Asian community, which has doubled, and the Latino community, which has nearly tripled. Granted, there has been considerable influx of new residents in the past decade, and 2020 may well tell a different story. But all the current statistics do not support "gentrification" as the primary cause, unless you consider Asians and Latinos, most of whom are first-time home owners of moderate means, to be "gentrifiers." Zachary Murray [program manager at the Oakland Community Land Trust] wants to bring the community into the conversation. That's good, although many Oakland neighborhoods are already well represented. But why does he worry that only Black neighborhoods need to be "brought into the conversation?" Aren't Asians and Latinos worth listening to? And refugees from the Middle East? Don't they have critical housing needs as well? The Express seems to be caught up in the racial disparities of the '60s. Your writers are trying to bring back Black residents when they should be more attentive to the other people of color who live here now. Thank you for telling it like it is, Mr. Aquis Bryant. The "I got here first" attitude of some locals is really obnoxious, not just in Oakland but in many places. Is everyone just supposed to stay where they were born forever? Is culture never supposed to change? I understand change is uncomfortable, and we need to do everything we can to make sure everyone's needs are met, but the truth is we are all competing for limited resources and you have to grow and evolve as things change, or someone else will figure out a way to take those resources from you. Also, those "Oakland Native" shirts are very strange and confrontational. Is the point of these shirts to "other" newcomers? Is it an invitation to ask you questions about the city? It's not clear. Just as an FYI, 60 percent of the housing in Vienna, Austria is "social," i.e. either sponsored by the government or nonprofits. And it's for folks across the income spectrum, with rents geared to reasonable percentage of income so costs may increase incrementally with income — but no pricing out. Having this much housing that isn't part of the market also keeps rents, etc. down in the private housing sector. There are alternatives, including partnered home ownership via land trusts as noted in the article, to housing models dominated completely by the market. I am impressed by the new A's ownership and especially Dave Kaval. In the last year, the A's have demonstrated a serious commitment to Oakland and expanding the A's fan base far better than Al Davis or his cherubic demon seed offspring (Mark Davis) have over 20 years. The A's have been public about what they want to do and how they will ultimately arrive at a decision. More importantly, they have engaged the community and really listened to Oakland residents. Recognizing the value of the unique Oakland flavor of the game day experience on the ramp from Coliseum BART to the stadium bodes well for the future. The A's have not only brought back ex-players and celebrated the history of the A's, they are being creative in reaching out to potential fans in order to ultimately fill the new stadium, wherever it may be. Howard Terminal offers the water element of the San Francisco Bay and the optics for television desired by Major League Baseball. However, the site has access and logistical challenges of rail crossings, Port of Oakland operations and no direct BART access that are difficult. The existing Coliseum site is probably the best option from a transportation and economic perspective. The city has already acquired multiple properties over the last 20 years for the purpose of building new sports venues on the property. Because of the Raiders' departure, only one facility is now required and the remaining site is large enough for other uses to be developed. The linkage between a new baseball stadium and what those surrounding uses can be is the real challenge. The city has already completed some level of environmental review for a mixed-use development on the site. Once the Raiders get out of town, the process can proceed. After Al and Mark Davis, along with Lew Wolff, the new A's ownership is a breath of fresh air. Perhaps we can finally move forward after a 20-year impasse since Jerry Brown torpedoed the Fox Theater site in Uptown. Even before gentrification was an issue, the names of Oakland neighborhoods were changing. For example, in the late 1980s, the section of Oakland where the 20s streets intersect with the 20s avenues was called the rolling 20s. Then in the mid 90s, it was called the twomps, which eventually evolved into the murder dubs. Names of neighborhoods have always evolved, but dumb people stay looking for a reason to complain. Maxwell Park named after it's developer John P. Maxwell. He built his home at 2625 Maxwell Avenue. The only home in that area that sits on a double lot. Nice styling! Check it out via Google maps. Traveling the area, you can find large concrete markers, staking out Maxwell Park boundaries. Momo Chang thoughtfully reported on sickle cell disease among African Americans and the biological, societal, and structural challenges that folks with the disease face. The Bay Area, despite its reputation of progressivism and its deep roots in the Civil Rights Movement, is not immune to the decades of structural racism — racism that continues to not only exacerbate health disparities but prevent access to key resources among the African-American community in which Medi-Cal becomes the only possible source of health insurance. If UCSF's comprehensive care center for children living with sickle cell is a respected model of treatment, Alameda County should require their contracted hospitals and clinics (providers who are required to take Medi-Cal) to develop an analogous treatment center or care coordination system for adults. These clinics are trusted by the communities they serve, and they would be even more effective in keeping people in care. Becoming an adult shouldn't mean additional pain and suffering for people living with sickle cell. Given the proportion of individuals living with sickle cell on Medi-Cal, it is up to our county to ensure that our communities aren't losing loved ones due to poor care and treatment of the disease. This is an exceptional piece of journalism. It is compelling, factual, pulls no punches, informs, educates and envisions. You talked to the right people and you shared the words that came from their hearts — it is brilliant when you can get a scientist to meta-phrase the factual so as to better convey a human tragedy. Your article made the historical geography of that important, but hardly remembered corner of Oakland make so much sense — CHORI, the first Black Panther headquarters (now the Its All Good Bakery), the Children's Hospital complex. There is Past, Present and Promise for addressing the problem of sickle cell anemia in your article. Thanks for telling the story, I will be sharing it with my students and friends. Gentrification Changed the Nam… Targeting Muslims?